We have seen Surya play larger-than-life roles in films such as “Perazhagan,” “Ghajini,” “Singam” and “7am Arivu.” In fact, in most of the films he has done, we remember him as the characters — such has been his portrayal. Now, we will see Surya as Surya — stylish, suave, natural and, of course, handsome — not on the silver screen but on television, as the host of Neengalum Vellalam Oru Kodi (NVOK), the Tamil version of Kaun Banega Crorepathi (KBC). The shooting of NVOK's first season begins in January 2012 and the show is all set to be launched in February 2012. Talking about Neengalum Vellalam Oru Kodi, K. Sriram, general manager, Vijay TV, says, “This is truly the first international format to hit the Tamil television screens and we are excited about it. We are proud we have managed to rope in Surya to host the show. Easily, he is the USP. This programme will be a game changer not only for Vijay TV but also for Tamil television. To strengthen the channel, we plan to launch two allied shows. We have planned an extensive, never-before-seen marketing campaign.” There is a whopping Rs. 1 crore to be won — an amount that can change an ordinary man's life forever. For Surya, it is a great chance to explore new markets. “The TV audience is six times more than that for cinema. NVOK will show my viewers the real me and not as any character I usually portray in films. The show will give me a chance to tell them that I am as down-to-earth as they are. 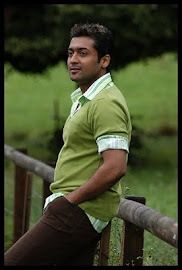 I think it will give me a totally different image that will help me in my career as an actor,” says Surya. In the midst of “Maatran” and a forthcoming film with director Hari, how does he manage to do a show like NVOK? “Thankfully, I am doing only ‘Maatran' now and have managed to allot substantial time for this show. We will shoot extensively to can as many episodes as possible before I start my next film around March or April next year,” says Surya. The mechanism to participate in the show will be announced on Vijay TV on December 25. Viewers will be given five days, i.e. between December 25 and 30, to contest and win a chance to take the hot seat opposite Suriya. The Call for Entry (CFE) is open only for five days after which the lines will be closed. All arrangements have been made to avoid jamming of lines given the popularity of the show and the huge response anticipated. The short-listed candidates will then go through a selection process — only a chosen few will have a shot at the game and a chance to take home Rs. 1 crore. The CFE questions will be announced on Vijay TV, on radio and in print from December 25 to 30.